Marty Turco isn't blowing into the Windy City just looking to make a difference. Rather, the 10-year veteran is focused on delivering the city of Chicago another Stanley Cup championship. Set to celebrate his 35th birthday, there's no doubt what the backstopper will be wishing for on August 13. Turco's numbers suggest the pairing just might add up to a second-straight championship. Second among active NHL goaltenders with a 2.31 career goals-against average (minimum 250 games) and sixth with 262 wins and 40 shutouts in 509 career regular-season games spanning 10 seasons with the Dallas Stars, the Sault Ste. Marie, Ontario native is Dallas' franchise leader in wins (262), shutouts (40), games played (509) and minutes played (29,064). Those statistics includes posting a 22-20-11 record with four shutouts, a 2.72 goals-against average and a .913 save percentage in 53 regular-season appearances in 2009-10. He is fifth among active NHL goaltenders with a 2.17 goals-against average during the Stanley Cup Playoffs, winning 21 games with a .914 save percentage in 47 postseason contests over five different campaigns. Turco has skated in three NHL All-Star Games (2003, 2004 and 2007), was named to the NHL Second All-Star Team in 2003 and was a member of the Team Canada entry at the 2006 Winter Olympic Games in Italy. He registered at least 30 wins in six consecutive seasons from 2002 to 2009, including a career-high 41 triumphs in 2005-06. The ‘Hawks are certainly happy to have him in the fold. A mainstay with the Stars, Turco appeared in 26 games in 2000-01 and 31 in 2001-02, displaying the poise and confidence that would lead to his role as the No. 1 goaltender. The Western Conference club anointed Turco as their starter in 2002-03. Turco, the 124th overall selection in 1994, delivered a stellar performance that campaign, highlighted by a 1.72 goals-against average (the best GAA in league history since World War II and a second-place finish in voting for the year-end Vezina Trophy. 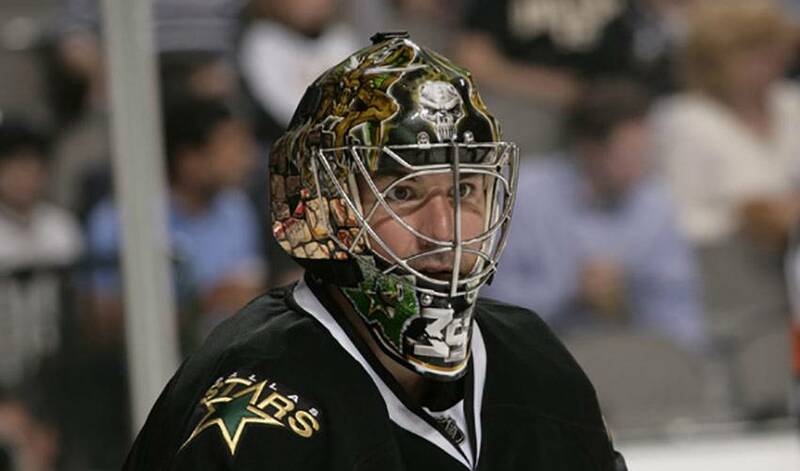 On January 15, 2009, Turco played in his 421st game for the Stars becoming the franchise's all-time leader in games played by a goaltender, eclipsing Cesare Maniago's near 33-year-old record. He would also pass Maniago later that month in total minutes played. On February 9, he broke yet another of Maniago's records by starting in his 24th consecutive game in goal. Turco, who took the Wolverines to the Final Four in each of his four years at the university, winning two NCAA National Championships (1996, 1998), doesn't have any regrets about the route he took to get to the NHL. “I was a late bloomer, to say the least,” he offered. “And staying in college four years wasn't really an option, because it was my only option when I got there. I'm glad it all went down like that, actually. I needed tbackground of education. And now he'd like to find his way back to the playoffs, a place he hasn't been to since 2007-08. And whether he hoists the Cup or doesn't, Turco is happy where he's at.